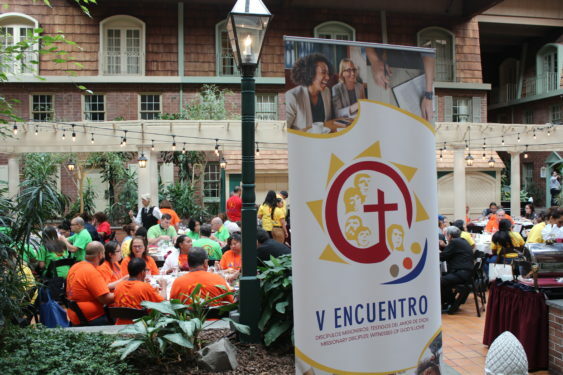 Albany, N.Y. – More than 300 Hispanic Catholic leaders from the eight dioceses of the State of New York gathered at the Desmond Hotel in the state capital, June 22-24, for the state regional meeting of the V Encuentro. Beginning in each diocese and culminating in a national session in Texas in September, V Encuentro seeks to give continuity to a dream started 46 years ago: to remark the Hispanic presence in “the Church on its pilgrimage to the kingdom” in the United States. Also present were Bishop Edward B. Scharfenberger, of Albany; Nicholas DiMarzio, Brooklyn; Richard J. Malone, Buffalo; Octavio Cisneros, Auxiliary Bishop of Brooklyn and Episcopal Representative of Region II for the V Encuentro; Robert J. Brennan, Auxiliary Bishop of Rockville Centre; and Bishop-elect Richard G. Henning of Rockville Centre. Cardinal Timothy Dolan, Archbishop of New York, spoke to the gathering via video, and was presented by Bishop Peter J. Byrne, Auxiliary Bishop of New York. 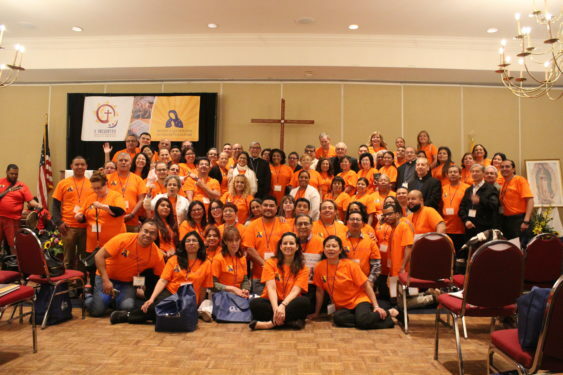 During the three days, the delegates, representing some of the 322 parishes serving the Hispanic community, created eight work groups to discuss the regional working document and produce the last draft of the document the State of New York will send to be included in the debates of the V National Encuentro of Hispanic/Latino Ministry in Grapevine, Texas, Sept. 20-23. The commissions considered a broad range of topics, from evangelization to catechesis, youth ministry and immigration. Bishop DiMarzio, an international authority on immigration, was part of the inter-diocesan commission on Immigration and Migrant Ministry and presented the report on immigration from the downstate region. “There are many messages but in general, basically that the welcome of the immigrant is important and that the Church needs to be perhaps more public about what it is doing because many people don’t understand it,” said Bishop DiMarzio. Reflecting on the need to have a more effective impact on policies and eventually help to shape a more comprehensive and compassionate immigration reform, Bishop DiMarzio called on Catholics to be vocal. “We need to have more people behind us because the Church can say what it says but each bishop is worth only one vote,” said Bishop DiMarzio. For Deacon Jorge Gonzalez, Co-chair of the Regional Encuentro, the event truly surpassed expectations. 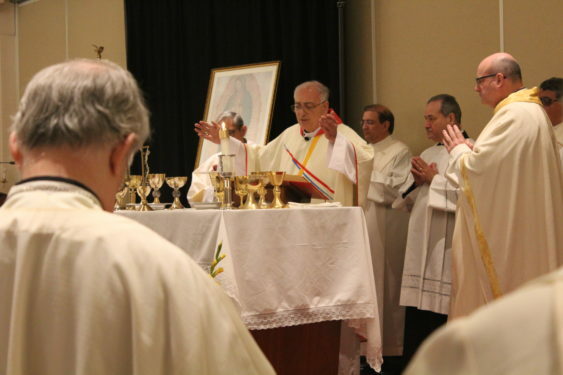 “Not only considering the number of delegates who attended it, which were more than 300, the presence of the bishops of all the dioceses, auxiliary bishops, priests and deacons, but above all because the energy, enthusiasm, and fraternal working environment among the different ministries, it exceeded our expectations,” said the Brooklyn deacon. Deacon Gonzalez also said that state Hispanic leaders are hoping to organize an event, if not annual at least bi-annual, that will focus mainly on youth. “As a region, we have a very particular common reality and we would like to see how can we deal with it all together,” he concluded. 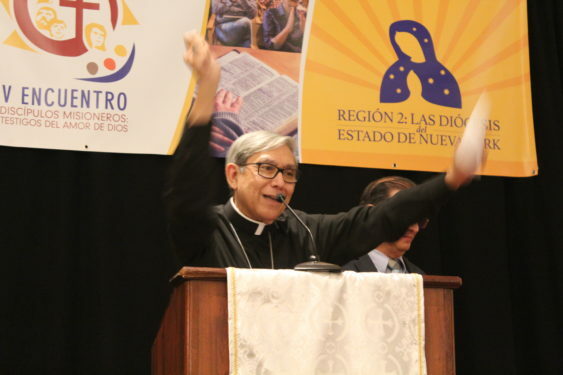 One of the main messages stressed at at this regional Encuentro was that Hispanics are not on the periphery, but part of the heart of the Church in the United States.